If you’re reading this then you are probably someone who likes to support small businesses so thank you! You might also be a last minute shopper looking for ideas so this is for you! All these products are currently only available on my website and my etsy shop making them an original choice! There’s a sneaky gift for you at the bottom of this page!!! ﻿GIFTS FOR PEOPLE WHO EAT! Brighten up someone’s kitchen with my EAT collection! I’ve got prints: EAT Herbs, EAT Sushi & EAT Oysters. You can buy off the shelf A4 print frames for these to easily have them ready to put up on a shelf, mantelpiece or wall. There’s a little bit to learn in each of them as well. 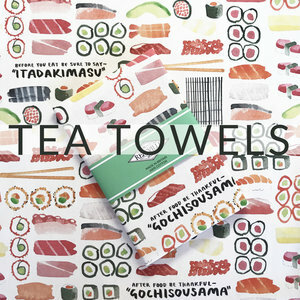 Everybody needs a tea towel! These are a really new product in my shop and have been so popular! People who like my paintings but worry about choosing a print for someone else have jumped on these. Someone even bought some as fancy gift wrap…I love that idea! And the final two in the Eat Collection are these EAT, SING, DANCE prints and tea towel. They are instructions for a good Christmas (add drink, snooze…the list is growing!) so make the perfect gift for a host and lover of typographical prints. I have the trio of prints in my hallway as a constant reminder to do all these things that make me happy! CLICK THE IMAGES TO SHOP! The Waterways and Wildlife of London was my first Rebsville print and has remained a popular one throughout the year. Often bought for men, it’s an original map of London that shows a small selection of the fish, birds and other creatures that have been spotted in and around the rivers of London. I also mapped and labelled all the overground, underground and man-made tributaries feeding into the Thames. Some of us have them, but most of us know some! These posters are fun, educational and affordable. I am a qualified primary school teacher with a pre-schooler at home and wanted these posters to be meaningful learning tools to support your child in their early years. Both posters have a list of learning activities at the bottom to inspire you when you are too exhausted to think! They are large..the size of a piece of wrapping paper…perfect for exploring with your pre-schoolers. I often don’t get around to sending my christmas cards by post but I like to write a proper message to the people I give a gift to. Christmas can be really hectic but I try and slow it down…have a think about what this person means to me and what I wish for them. I used to be a big letter writer so it’s a chance to say a few words to the people I love. So those are my faves! All the images are clickable and link you straight to the product page…have a good old browse and see what you fancy! If you have got this far then here’s a massive 20% off all orders over £25. That means you can bag a print for £16 or a teatowel for a tenner! The code is BIG20 and is valid up to Xmas (last delivery day is 18th but if you are local to me you can pick up until the 22nd - London SE24)… thanks for shopping and supporting me and mine this year.